The remaining four 2018 designs have all been replaced with recently removed and retired dies. The 2018 Main Street Railroad Station quarter design at Magic Kingdom has been replaced with the Tinker Bell design that was in the quarter machine at the Emporium when the die was replaced with a 2019 design. The 2018 quarter design at the Contemporary Resort was replaced with the Friends 8 of 8 design with Mickey, Donald & Goofy that was removed from 1900 Park Fare at Grand Floridian Resort & Spa in July of last year. The 2018 penny design at the Contemporary Resort now has an old design from the Disney's Villains series. The design from this series is 1 of 7 with Jafar and this design was removed over five years ago in 2013 when it was located in a 3-die machine at Cap'n Jack's Oyster Bar at Downtown Disney Marketplace. At the Yacht & Beach Club Resorts near Lafferty's Place Arcade and Beaches & Cream Soda Shop the 2018 penny design was replaced with the Pocahontas & John Smith design that was removed when the 2019 design was placed in the machine at the Polynesian Village Resort near Moana Mercantile store. A new 8-die machine is now on-stage at Magic Kingdom in the Curtain Call Collectibles gift shop located on Main Street USA. This new 8-die machine has five different characters from Peter Pan - Tinker Bell, Peter Pan, Captain Hook, Tick-Tock the Crocodile and Wendy. The three remaining designs in this machine have Mickey, Mickey & Minnie and Mickey & Pluto. All eight designs have the Disney and Magic Kingdom logos on them. New 2019 pressed coins are now at the Disney's Art of Animation and Polynesian Village Resorts. It appears that with the addition of these two coins that this will complete the installation of the Walt Disney World commemorative pressed coins for the year 2019. 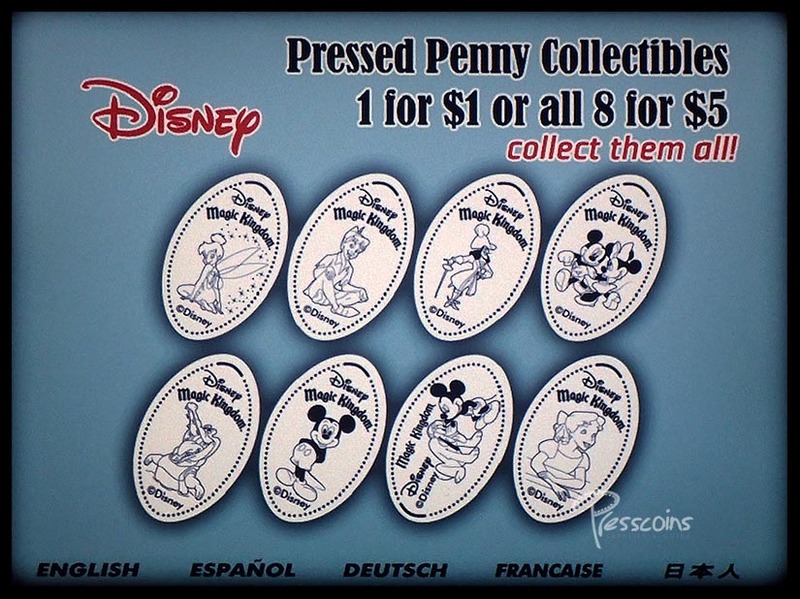 This year there are 9 pressed pennies and 7 quarters for a total of sixteen coins instead of the usual fifteen coins that have been available each year since 2015 due to one additional penny design this year. This year was also a little different since there were a few location changes and there are currently four 2018 coins that are still on-stage. There are quarter designs still at the Main Street Railroad Station and the Contemporary Resort with the year 2018. At the Contemporary and Yacht & Beach Club Resorts there are still 2018 pennies. We expect these four 2018 designs to either be replaced or removed within the near future. The last two coins for 2019 are Daisy at the Arts of Animation Resort which replaces a penny design with Disney's Art of Animation Resort logo. At the Polynesian Village Resort a 2019 penny design with Minnie replaces the design with Pocahontas and John Smith that was in this machine located outside Moana Mercantile. This same design is available as a quarter at the All-Star Music Resort. 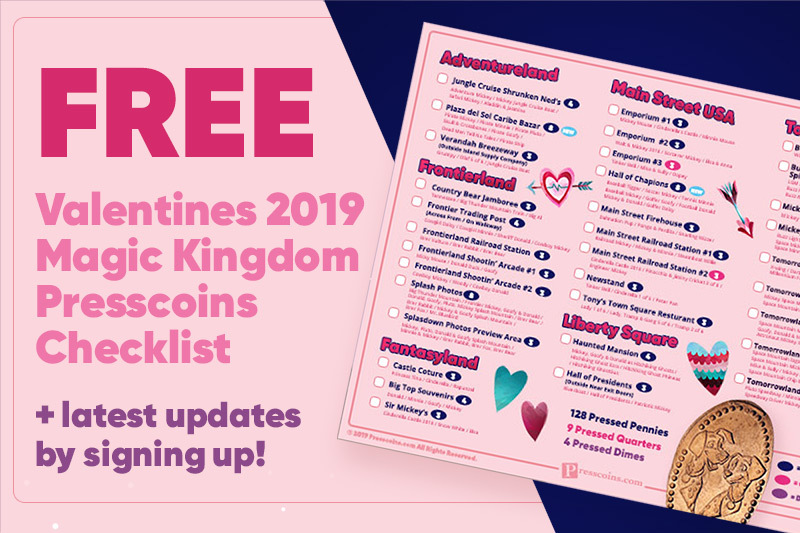 In addition to the 2019 quarter that was previously reported at The Land near Garden Grill Restaurant two more 2019 coins are now available at Mouse Gears and Disney Traders replacing the 2018 coins that were at these locations. At Mouse Gears is a new 2019 penny design with Spaceship Earth. At Disney Traders the 2018 penny has been replaced with a 2019 design with Mickey. This same design is available as a quarter in the Emporium at Magic Kingdom. 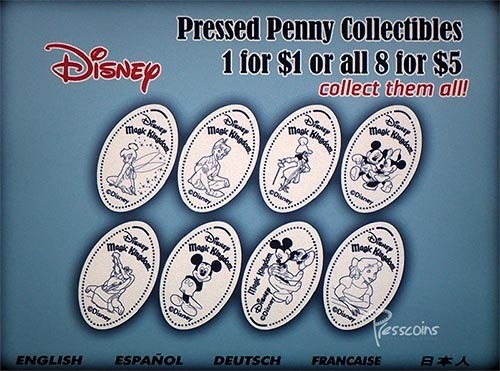 Three new 2019 pressed coins are now available at the Magic Kingdom. At the Emporium is a new 2019 penny design with Chip & Dale. This same design is also available as a quarter at The Land near Garden Grill Restaurant at Epcot. The quarter machine at the Emporium also has a new 2019 quarter design replacing the design with Tinker Bell that was in this machine. This same 2019 design is available as a penny in Disney Traders at Epcot. At Sir Mickey's the 2018 penny has been replaced with a 2019 design with Mickey. The 2018 pressed quarter designs at Disney's All-Star Sports & All-Star Music Resorts have been replaced with new 2019 designs. At All-Star Sports Resort is a new 2019 quarter design with Goofy At All-Star Music Resort the 2018 quarter has been replaced with a 2019 design with Minnie. The six Disney's Animal Kingdom 20th Annversary pennies have been replaced. The two 3-die machines that are currently located at Mombasa Marketplace and the Outpost Shop that had these designs now have new designs with the same characters and wording of Disney Conservation Fund at the bottom. Only the wording at the top of each coin has been changed from Disney's Animal Kingdom 20th Annversary to just Disney's Animal Kingdom. The 2018 pressed coin designs at Animal Kingdom have been replaced with new 2019 designs. At Chester and Hester's Dinosaur Treasures is a new 2019 penny design with the Tree of Life. At Harambe Railway Station the 2018 quarter has been replaced with a 2019 design with Pluto. This design is also available as a penny at the All-Star Movie Resort that is shown below. Below are the 2019 quarter and penny designs that are available at All-Star Movie Resort. The 2019 quarter with Donald Duck replaces the 2018 quarter with Mickey Mouse. There was no 2018 penny located at this resort last year but there is a 2019 penny design for this year. 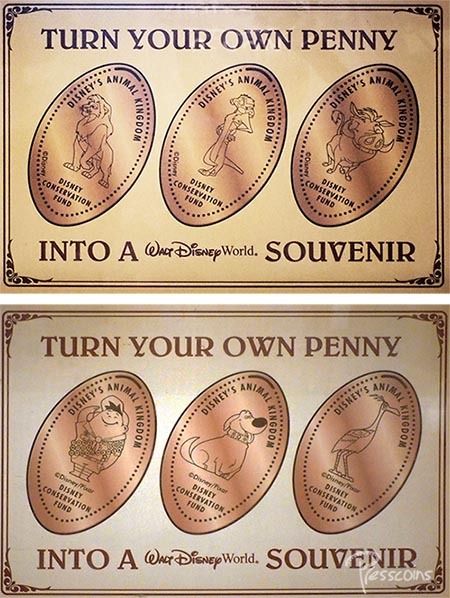 The 2019 penny with Pluto is the same design as the quarter design at Harambe Railway Station at Animal Kingdom. This new design replaces the design with Rex from the Disney's Toy Story movie. The 2019 Walt Disney World coins have started being put on-stage as of December 29, 2018. Below are three of these new coins that are currently available. The Hollywood Tower Hotel 2019 quarter is in the machine at Tower Hotel Gifts at Hollywood Studios and it replaces the design that has the Hollywood Tower Hotel crest. The 2019 penny that has Maleficent's Dragon replaces the 2018 penny at Rock Around the Shop at Hollywood Studios. The 2019 quarter with Chip & Dale replaces the 2018 quarter in the machine at The Land near The Garden Grill Restaurant.